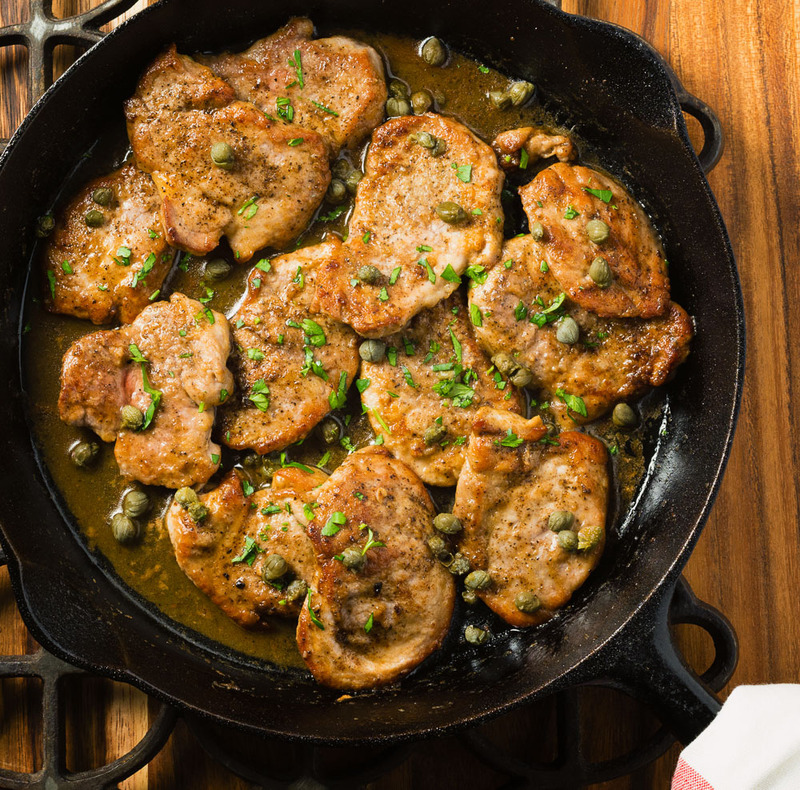 Pork piccata is a great alternative to the more obvious chicken piccata. It’s easier to prep. It’s less likely to dry out. And it has more flavour. What is not to love here? Does the world need another chicken piccata recipe? I’m pretty sure not. And yet, here I am doing it. I justify it to myself because I have two observations to share. One – why so much lemon? I see recipes with the juice of two lemons. Two lemons. That’s half a lemon per portion. Then they claw back the acidity by adding a bunch of butter. It’s adding calories to hide a flaw. Crazy. I’ve used pork tenderloin here. If you wanted bigger pieces maybe a small loin could sub in but you’d need to be careful because you run the risk of tougher meat. The tenderloin is pounded a bit so it’s a fair size. Kind of veal picatta size. And for the record, they are adding butter to balance a ton of lemon so they can add more butter. Fat tastes good. But it’s a lot of calories for not much gain. 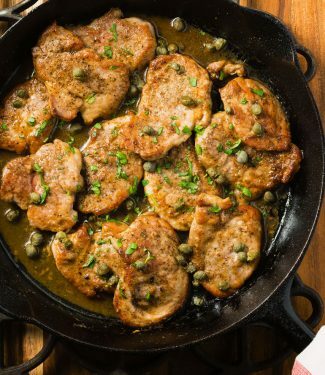 Pork picatta is a great alternative to the usual chicken. The sauce is nicely balanced. Lemony but not overly so. Italian flat parsley minced. Don't use curly parsley. Remove any silverskin from the pork tenderloin. Cut the pork across the tenderloin into 3/4 inch medallions. Pound the medallions to 1/4 inch thick. Add one Tbsp butter and one Tbsp olive oil. Dredge the pork in the flour and fry until the edges start to turn white, about 60-90 seconds. Only add as much as will fit comfortably in one layer. Flip and cook another 45 seconds to one minute. You don't want to overcook the pork.Remove pork from pan. Add remaining Tbsp olive oil and repeat with the remaining pork. Deglaze the pan with the lemon juice, stirring constantly. When it has almost completely evaporated add the chicken stock and simmer for about 1 minute. Return the pork and accumulated juices to the pan to warm up the pork. Simmer about a minute. The flour from the pork will thicken the sauce slightly. Add the capers. Off heat add the remaining one Tbsp butter to enrich the sauce. Jostle the pork around a bit to distribute the butter. Awkward but easier than removing all the pork. Adjust seasoning.